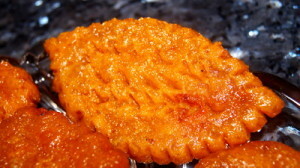 Moong Pakon Pitha is traditionally made with moong dal and rice flour and soaked in thick syrup. I found instead of rice flour, we can use plain flour. 1. Roast moong dal on slow heat until lentil is crisp. But be careful we don’t want to burn it. 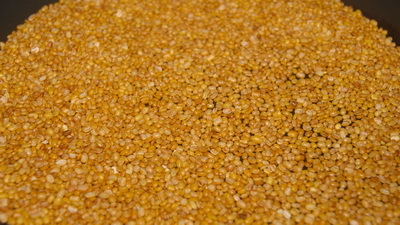 And soak dal in water 15 minutes. Then drain the water. 2. 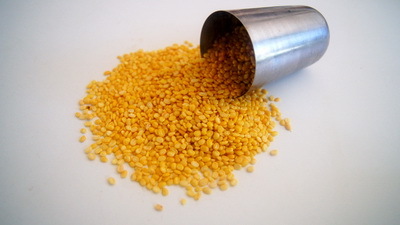 Boil dal in about 3 cups water ( if you need add more warm water ). When dal is cooking and soften up, add flour and salt. Mix well and make dry enough to playable dough. 3. Turn off the heat and keep it 5 minutes under closed lid. 4. In mean while make sugar syrup. Take sugar, cardamom, cinnamon in a sauce pan and 1 cup water, bring it into boiling point. Turn off heat and keep syrup aside. We need lukewarm syrup. 6. Heat oil for deep fry. Fry pitha on medium heat till it becomes golden brown in both side. 7. 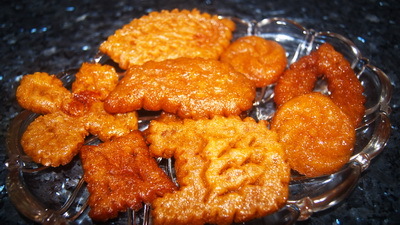 Take out pitha from oil and soak into syrup about 2 minutes. 8. Enjoy Moong Pakon pitha and make your life sweeter. Have been looking for something like this for a while. It would be great to have video with it. thnxx alot aapu.. but i have 1 question… the mug dal no need to blend ??? dont need to blend. when you are boiling, it will become paste..